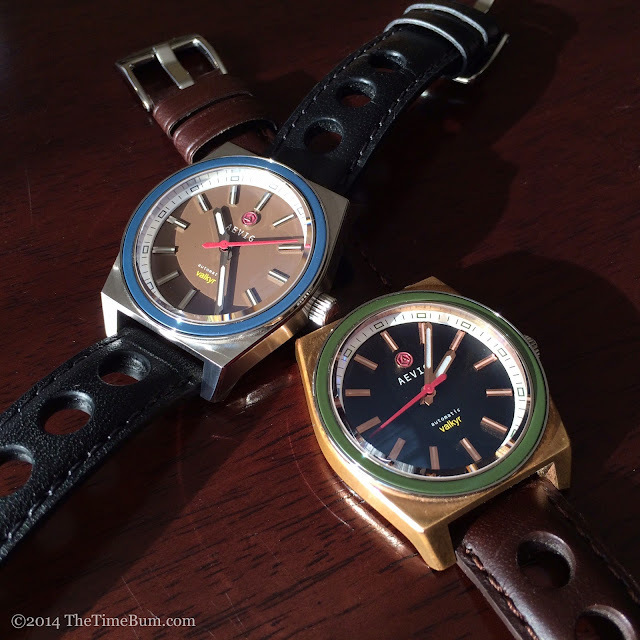 When Chip Yuen offered to lend me two prototypes of the new Aevig Valkyr automatic for review, I jumped at the chance. 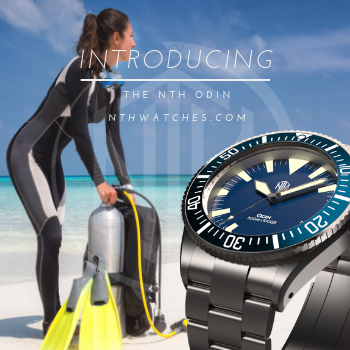 I had already featured his previous models, the Corvid quartz field watch and Huldra automatic dive watch, and was highly impressed. Chip has a background in fine arts and industrial design, as well as a sharp eye for watch design, so I was excited to see his third act. Valkyr buyers may choose from six variants. I figured that contrasting dials and bezels would give me the best impression of the range, so I requested one bronze case with a black dial and green bezel, and one steel case with a brown dial and blue bezel. My selections did not disappoint. 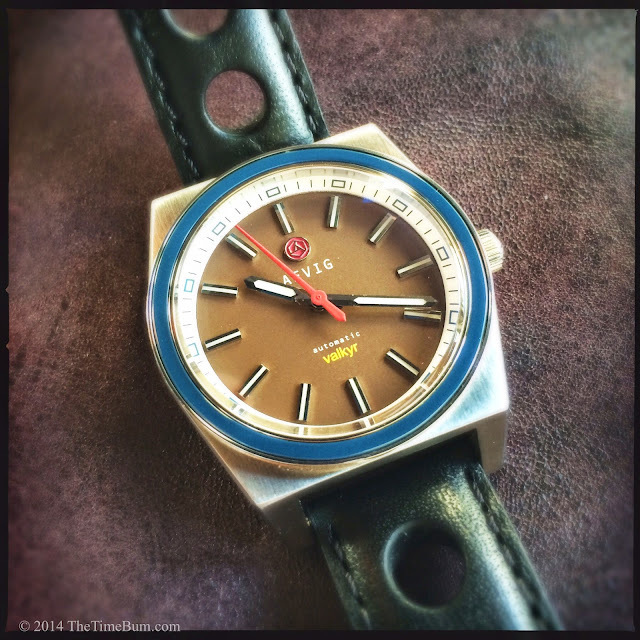 Like his previous efforts, the Valkyr was inspired by 1970s sport watches. 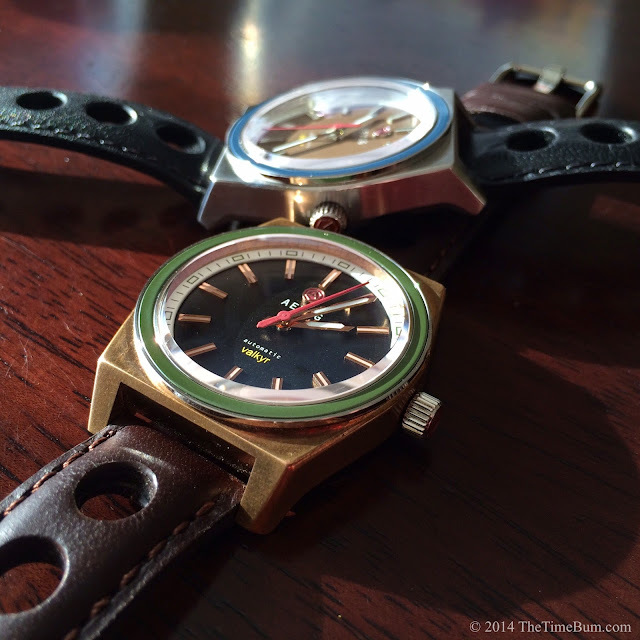 Aficionados of the era might recognize some Tissot, Seiko, and Zodiac influences. The case is roughly box shaped with north-south brushing and sharply defined corners. 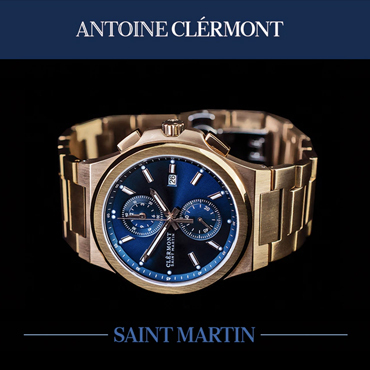 It is available in CuSn8 bronze or 316L stainless steel cases, measuring 39mm across, 48mm long, and 14mm thick. Square or cushion cases tend to wear much larger than their dimensions suggest, but the Valkyr is actually quite compact. 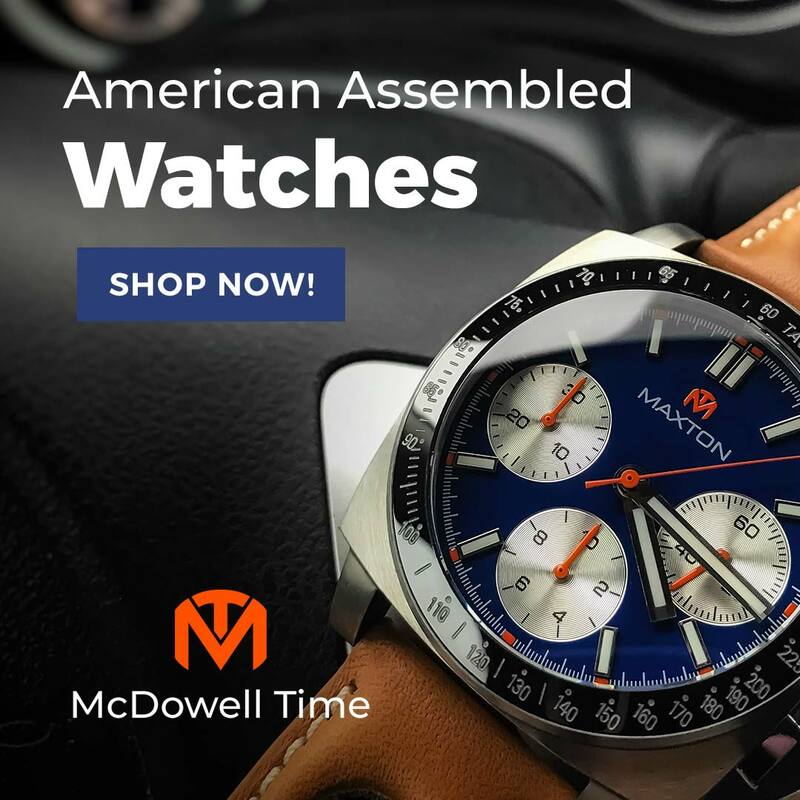 You will not mistake it for a dress watch, but it is a comfortable fit on even a small wrist, slipping under most shirt cuffs and announcing its presence with style, not size. The case sides bow around the circular dial and bezel, the lugs are angled outward and down, and a beveled edge runs the length of the case. These subtle variations trim the appearance of the watch and make it far more interesting than if it had been a simple square. In profile, you will notice the otherwise flat sides tuck under as they approach the back side, thereby eliminating a hard edge where the case meets the wrist. 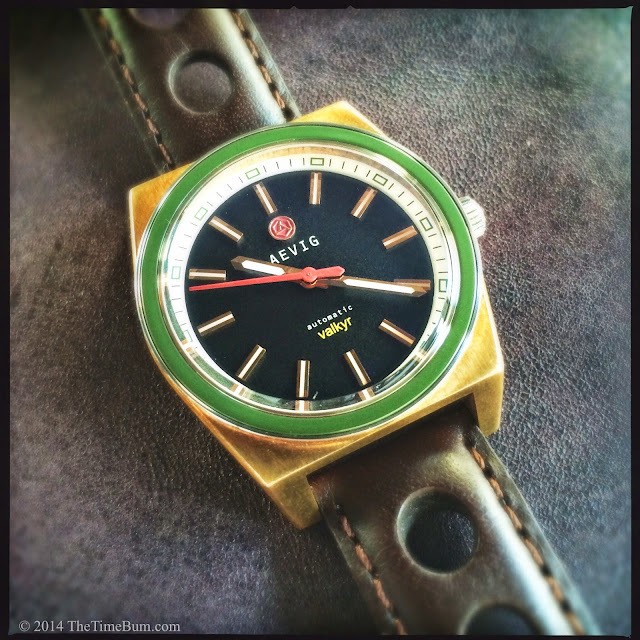 The 3 o'clock crown is coin edged and signed with a cast Aevig hexagon logo painted dark red. 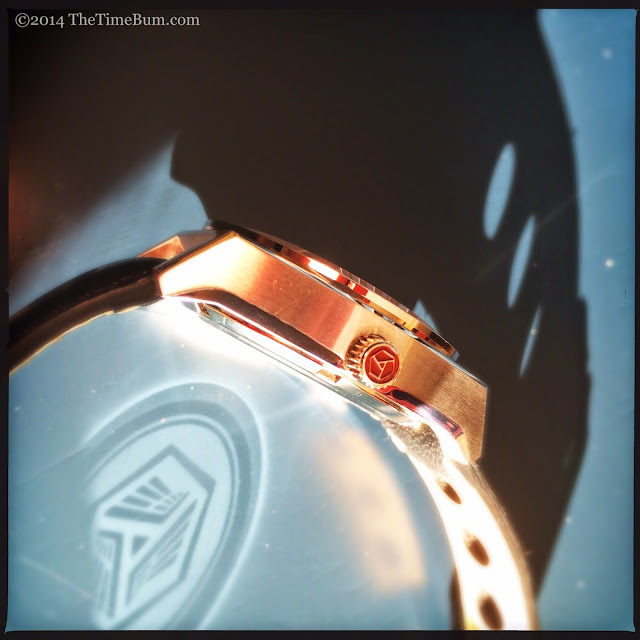 This same logo graces the dial as well. The combination of relief and color reminded me of a wax seal. Both the crown and case back screw down. This Valkyr has a 100 meter water resistance rating, which goes far to making it a versatile, all-purpose accessory. The case back is engraved with the hexagon logo, but in a nod to the model name, it is rendered with a stylized wing motif. Inside the Valkyr, a trusty Miyota 9015 automatic movement purrs along at a smooth 28.8k bph. This familiar 24 jewel movement hacks, hand winds, and has a 40 hour power reserve. It also typically has a date function, but this has been omitted from the Valkyr's dial, and frankly, I did not miss it one bit. A sapphire crystal tops it all off. It is double domed, with an internal anti-reflective coating and a sharp beveled edge. The dome is fairly pronounced, standing high above the bezel. This may increase the chance of chipping, but that is a risk I'm willing to take. The tall dome is perfectly in keeping with the retro feel, and it just looks cool. The strap is 20mm wide and rally style, with three large holes on each end. Black and brown will be offered. The straps pictured on the prototypes are not planned for production. The final versions will be thicker, will not taper, will have contrasting white stitching, and a signed brushed buckle. This may well be the only feature to change on the production watch. The prototypes were otherwise already quite sorted and the level of finish was excellent. The bezel is stainless on both versions. The edge is polished and it is fitted with a flat ceramic insert in blue or green. The intensity of the color varies greatly depending on the light. Under most circumstances, it is dark and muted but it pops to life in direct sunlight. It is one of the defining characteristics of the watch and was a fun effect to play with when I was photographing the samples. Dials are offered in a choice of blue, green, or black, but all have a white chapter ring. Applied markers are color keyed to the case, and along with the baton hands, are treated with BG-W9 for a bluish glow. Dial text is minimal, but each line is distinctive: applied red logo and white printed brand name in capital letters at the top, printed white "automatic" and yellow "valkyr" at the bottom. A red second hand is the final touch. I have to applaud Chip's use of color. Had he played it safe with simple black-and-white dials, or a single accent color, he still would have created very attractive watches; however, he took a more complex route, selecting combinations that are less common, and require a keen eye to pair convincingly. He executed it perfectly, rewarding us with rich and nuanced combinations that stand apart from the crowd. The stainless/brown/blue was cool combination in both tone and appeal. The brown dial is the color of café au lait, mellower than the cold colors of the steel case and dark blue bezel surrounding it. 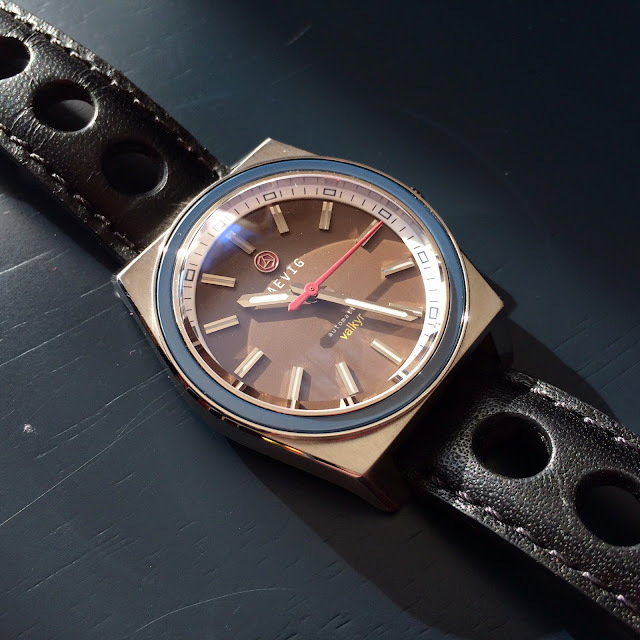 The dial accents appeared as subtle hints of color against the mellow brown. The overall look was smooth, stylish, and reserved. 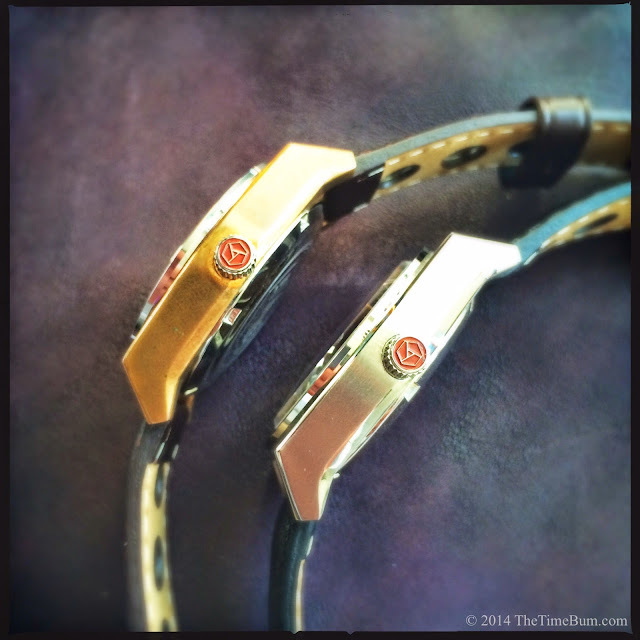 The clean, sleek looks of the stainless model make it easy to wear with a wide variety of outfits. The drilled strap keeps it firmly in the sport/casual side of the sartorial spectrum, but add a dark brown or navy leather dress strap, and it could easily step up to a coat and tie. The bronze/black/green arrived with a well developed patina, burnished at the edges from normal handling. This watch is the warmer of the two. Multiple tones of reddish gold and mottled brown complement the green ceramic, lending it a more organic appearance. The black dial anchors the piece while its applied markers and colored elements jump off the dial in bold contrast. 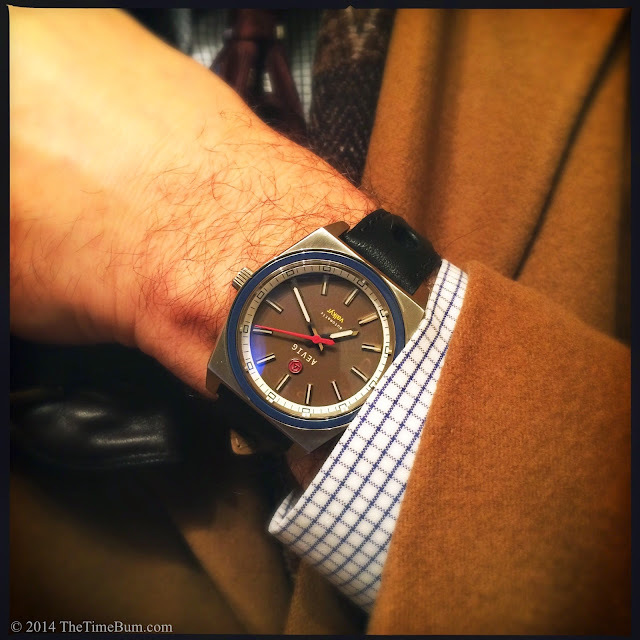 I would happily wear this watch all year long, but there is something particularly autumnal in its delicious panoply of gold, red, and green, like fall foliage in the hour before sunset. The combination is a natural complement to textured fabrics like denim and tweed. With the Valkyr, Chip has captured the best aspects of some 1970s sport watch designs, updated them with a contemporary palette, and infused them with his own personality, creating watches with marvelous character. He has also managed to deliver them at a very reasonable price. 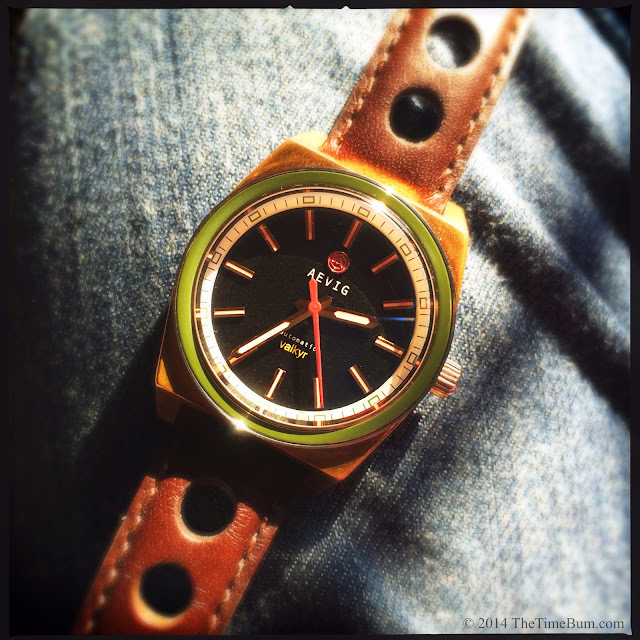 You can pre-order yours directly from Aevig for €450 (@ $557 USD). Knock 21 per cent VAT off that price if you are ordering outside the EU, which brings it down to about $440 USD at today's exchange rate. Better still, early orders can get additional discounts of up to €100 (@ $120 USD). 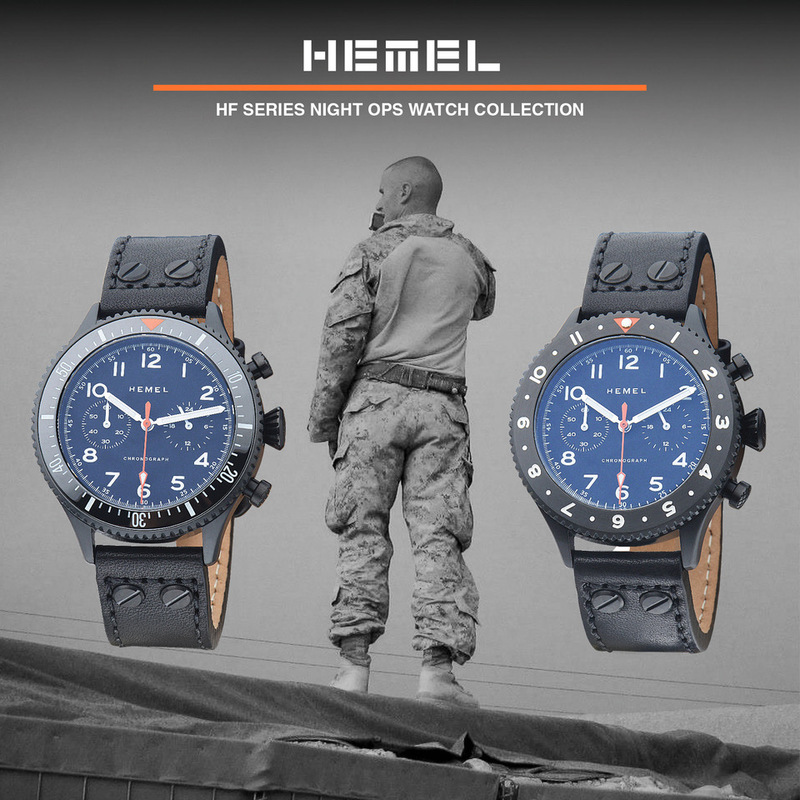 See the Aevig site for details. Con: They won't ship until April. 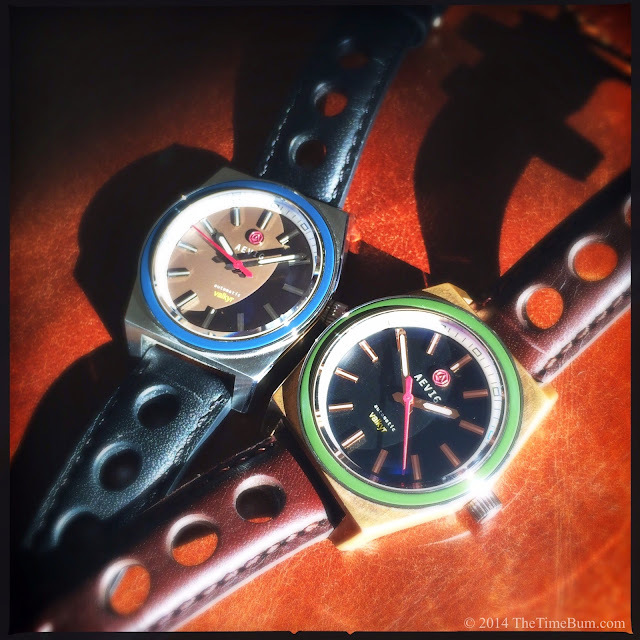 Sum: Retro-modern done right. The Time Bum approves.